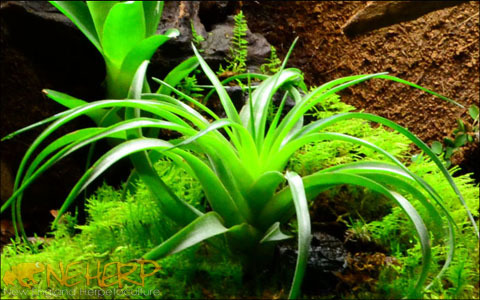 Live Bromeliads For Terrariums & Vivariums | NEHERP - Your One Stop Vivarium Shop! 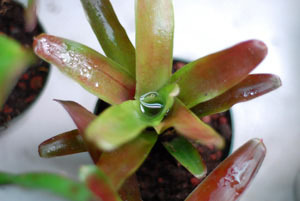 Bromeliads are a large family of tropical plants which are primarily epiphytic. 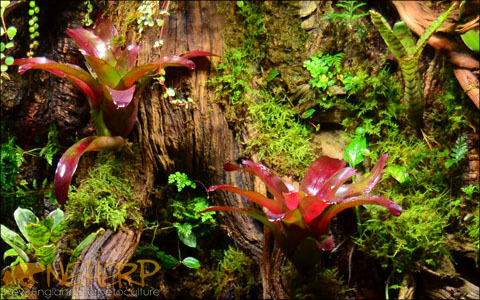 The term "epiphyte" describes any plant which typically grows on other plants, instead of in soil. These plants absorb their nutrients & moisture from the air & surroundings, rather than a more typical subterranean root system. The roots on most of the Bromeliads we carry instead act mostly as a natural way for a plant to cling or mount itself to it's surroundings. 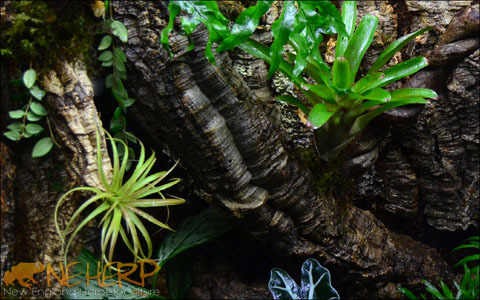 We've included briefly summarized planting advice in each plant's description below, and we've also got more detailed recommendations for planting epiphytic plants in our Vivarium Construction 101 Article. We do our best to grow every plant we can ourselves in our indoor grow rooms. That being said, Bromeliads are a necessary exception since doing so would require acres of greenhouses in fair weather year-round. (New England winters can be brutal!) 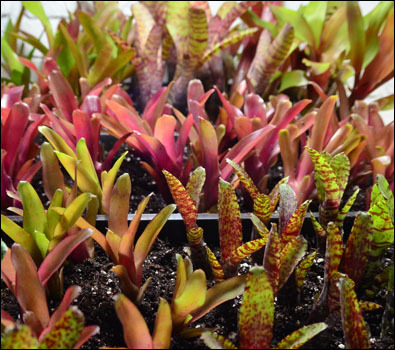 Having said that, we've spent the past 10+ years developing relationships with the best Bromeliad specialists in the USA, and we've taken a few unique steps to ensure the Bromeliads we sell stand out. Below, we'll break down some of what makes our plants unique. Upon arrival, we individually process each plant in our bare rooting tool, label it, and place it in extra large grow cells. Since the beginning of 2018, each cell is illuminated with custom lights which blast the plants with a ridiculous amount of PAR light (Over 650µMol/M²S PAR @ 12in!) to ensure the color of each plant increases while it's in our care. In addition, each cell's temperature, misting, drainage, and active ventilation is fully automated to ensure the plants stay as happy & healthy as they can be. We've been working with our primary Tillandsia supplier for over a decade, and we've developed a particular way to care for them once they arrive at our shop. After a quick processing procedure & careful inspection, our air plants are placed on species-specific trays & treated to plenty of PAR light (65-100µMol/M²S PAR @ 12in). Automated misting sessions occur on different schedules depending on the specific species, and we use only pure reverse osmosis filtered water to hydrate these plants. Airflow is always important when growing Tillandsias, and the majority of our air plants are in a direct path of oscillating fans which are scheduled to run a few times daily. Going the extra mile to care for our air plants allows certain species to actually color-up while they are in our care, and we're proud of the quality of the finished plants we've got available. Most of our Aechmeas, Cryptanthus, and Vriesea (not often available) are sourced from a local family-owned specialty greenhouse we've been working with since we opened for business. Cryptanthus & smaller plants are kept in similar conditions to our Tillandsias with plenty of airflow, high humidity, and filtered water to ensure the plants thrive while they are in our care. 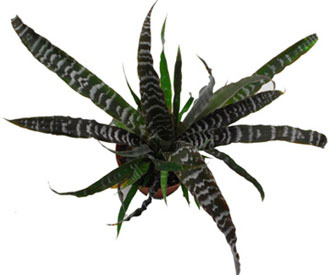 Every Bromeliad is different, and the majority we carry prefer to be mounted to a background or hardscape decor. Aechmea & Cryptanthus are the only two Bromeliads which we carry that typically thrives when planted in our live vivarium substrate. 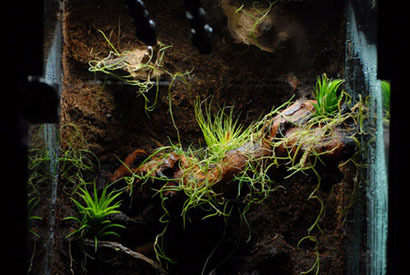 Neoregelias & Tillandsias must be mounted up high to thrive, and placing them near a source of PAR light (like our Vivarium Lighting Kits) is an ideal way to ensure they remain colorful after they arrive. 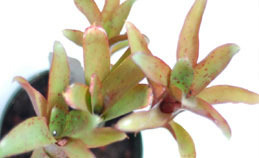 We offer an inexpensive Plant Mounting Kit for this purpose, which has some specific advice in it's item description. 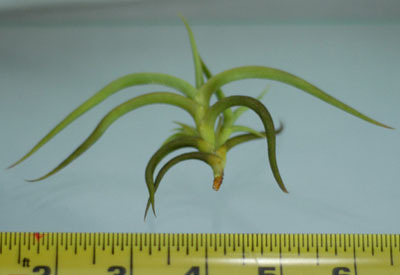 You can learn more about mounting Tillandsias in our Tillandsia care article, and more about mounting Neoregelias in Vivarium Construction 101. Neoregelias are an especially popular choice with keepers of dart frogs & other small amphibians, since the water-filled axil of the plant can be used for tadpole rearing! Plant nurseries roughly categorize their plants by pot size, and a plant is made available once it has mostly filled out it's container. Generally speaking, a 4in potted plant is roughly twice the size of a 3in pot, and a 3in potted plant is typically twice the size of a 2in pot. 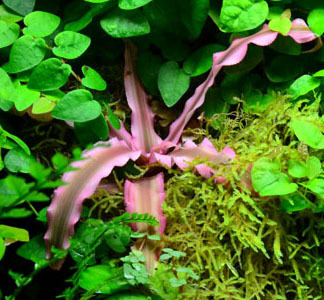 Needless to say, we do our best to offer big & healthy plants which were categorized honestly, and are representative of the photos we've got listed on the site. Every potted plant we sell is shipped bare root, and the root ball of the plant is carefully wrapped in paper towels before it's placed back into it's cleaned pot for shipping. From there, it's wrapped in clean brown packing paper and labeled with it's species before shipping. We're proud to offer a brand new way to order plants, and we're loving the results so far. Our Live Mats are grown with plenty of light & the ideal amount of moisture required to form a dense mat. Before shipping, each section is gently separated from it's sealed container, rinsed free of excess potting soil, and carefully placed in a partially inflated airtight bag. 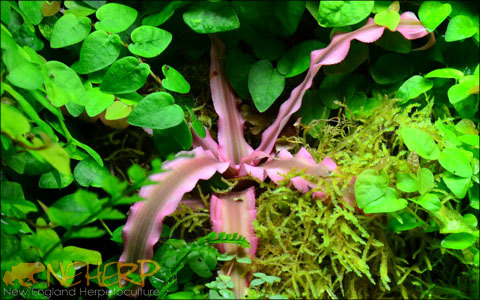 Depending on the specific plant, live mats can planted terrestrially or attached to a background to grow epiphytically. These are exceptionally dense portions of plants, so a little can go a long way! Some plants we grow are offered in rooted portions, which are slightly smaller portions than would typically be included in a 3in pot. The length and overall portion size depends on the species being offered, but these do include a portion of the root system for easy planting & fast acclimation. When it comes time to ship, we'll carefully separate the portion from it's mother plant, rinse the roots free of potting soil, and carefully wrap the roots in a ball of moist paper towels. From there, the plant is wrapped in clean brown packing paper and labeled with it's species before shipping. Clippings are the smallest size portion of what we offer. Depending on the species, clippings may or may not include small attached roots. Plants we sell as clippings are typically epiphytic in nature, meaning they'll grow without soil on the surface of another plant (or wood decor, backgrounds, etc). The difficulty in planting clippings depends entirely on the species, so don't hesitate to ask before ordering if you are curious. When it comes time to ship, we carefully clean, wrap, and seal our clippings in partially filled bags to ensure the safest transit possible. Like everything else we sell, these are individually labeled with ID. 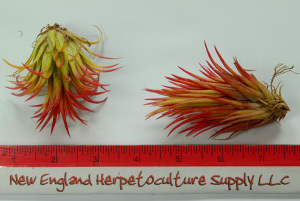 This large, unique Bromeliad is a member of the Aechmea genus. It's versatile enough to thrive as a houseplant, or in very (very!) large vivariums. 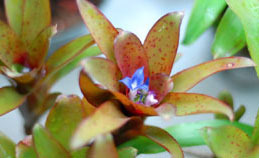 Over time, a large pink spike with bright blue flowers will grow from the center of the plant's axil. Thrives under bright light with plenty of humidity. Can be planted terrestrially in well draining soil, or epiphytically in a more humid environment. Our largest Bromeliad, this plant is sold nearly Adult Plant With Pup at around 18in. 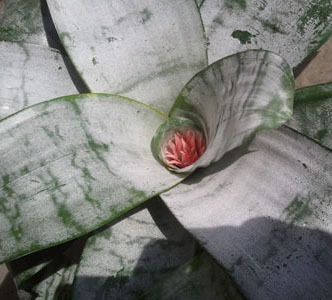 Too big for us to propagate in our grow rooms, Aechmea fasciata is sourced from a trusted, local (Connecticut) grower. Bright, filtered sun Very fast draining Mild, balanced (Axil-fed) Keep axil full. Flush occasionally. Nutrient data listed for houseplant care only. Additional nutrients are not typically required in properly designed live vivaria. 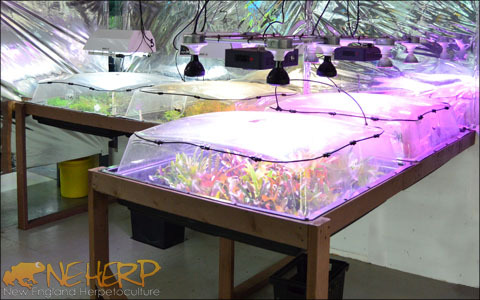 To see our NEHERP Plant Info panel, please visit this page on a device with a bigger screen. Note: If enough people reserve this plant ahead of time, it may sell out before ever becoming publicly available. 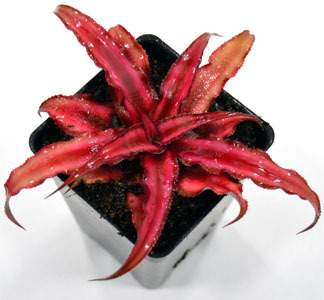 We've got some beautiful Cryptanthus with great coloration and shape available! Ours are healthy, vibrant, and are grown long enough to resemble the healthy plants in the photos above. Colors range from deep green to bright red/pink. All plants will turn bright pink/red when kept in ideal conditions with plenty of PAR light. When kept as a houseplant, we recommend using a mix of 25-50% sterilized sand, 75-50% lightly acidic potting soil. 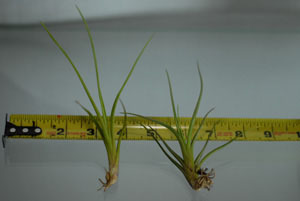 The pictured plant (left) is growing in a 3in pot. A very versatile plant if humidity is kept high. Survives in average light, but red color grows brighter lots of PAR light. If planting epiphytically in 55-70% R/H, gently wrap roots in Sphagnum. Higher humidity mounts will not need Sphagnum. A unique black & silver cultivar of Cryptanthus. 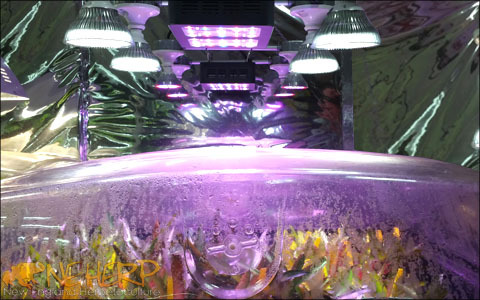 It'll thrive in a wide variety of lighting conditions, with high humidity being preferred. Expect white flowers at maturity, and frequent throwing of offsets after that. In brighter light, the white/silver markings grow to be more apparent. The pictured plant is growing in a 4in pot. A very versatile plant if humidity is kept high. Survives in average light, but white/silver color grows brighter lots of PAR light. 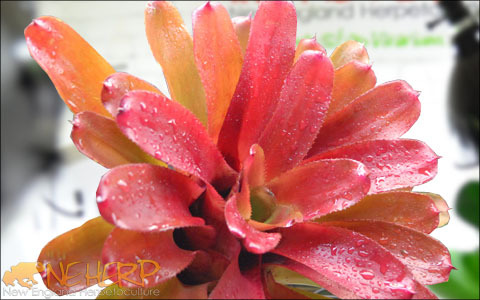 Our best selling individually purchased Bromeliad, Chiquita Linda is a hybrid of N. lilliputiana and N. fireball. Color ranges from a spotted red/orange to spotted green depending on lighting, with higher PAR levels bringing out the red & orange hues. 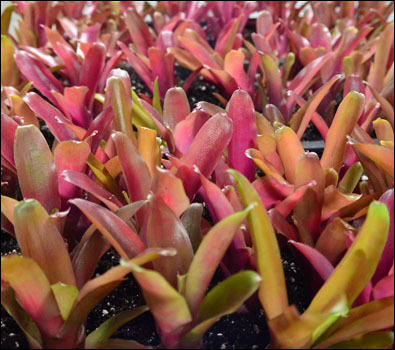 This plant produces offsets faster than any other Bromeliad we offer, creating spectacular looking clumps over time. 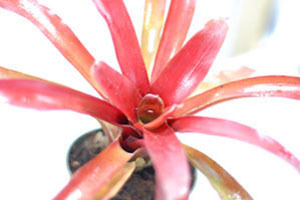 Probably the most commonly used vivarium appropriate Bromeliad available today, thanks to it's compact growth pattern & bright red coloration in good conditions. As N. fireball matures under good (high PAR) lighting, the red becomes more and more apparent. We always pull our brightest plants first. For a plant to end up on the "Grade B" rack, it must be either faded and/or slightly damaged. While aesthetically imperfect, all of our Grade B plants are guaranteed otherwise healthy & viable. 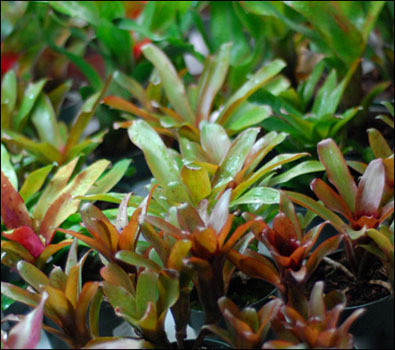 Most of the available plants are our "usual" stock Neos, but without the color and/or shape our plants are known for. Each of these will be a 3-Pack (5-13in) plant, individually wrapped & labeled with an ID. A great deal if you don't mind starting with an imperfect plant! 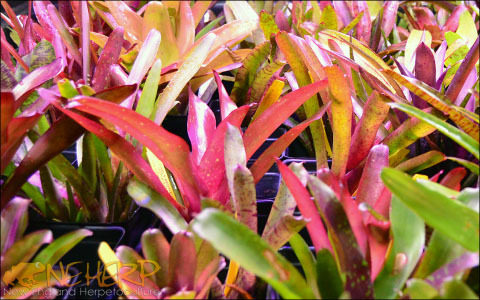 Neoregelia "pups" are young divisions of a mature Neoregelia, perfect for use in a live vivarium. Each plant is individually wrapped & labeled with specific cultivar ID. This is most popular & highest-discounted way to purchase our healthy Neoregelias. 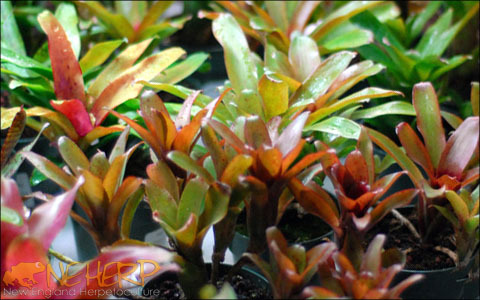 All varieties included are on the smaller side when mature, and are appropriate for live vivariums & terrariums. We do our absolute best to keep repeat species to a minimum in each assortment, to ensure an awesome variety. A longer Tillandsia that flowers bright purple & hot pink. Planting it up high will result in the plant growing downward into a desirable long, trailing shape. 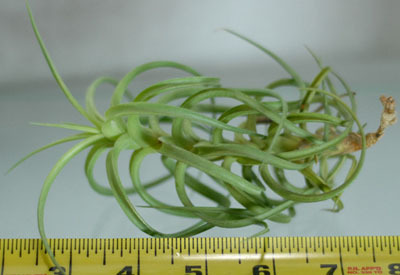 The Tillandsia species we carry are strictly epiphytic and cannot be planted in substrate for any length of time. We recommend mounting them near a vent, or anywhere in an enclosure which has an abundant amount of airflow. Allow to dry out between misting sessions, and do not place this species in the direct line of a misting nozzle. A very interesting small Tillandsia commonly used as an accent. Does not tolerate periods of dryness. Throws pups/offsets frequently, and flowers bright red. One of our larger Tillandsias, this is our most moisture-tolerant species of air plant, and the one we use most often in vivariums at NEHERP. 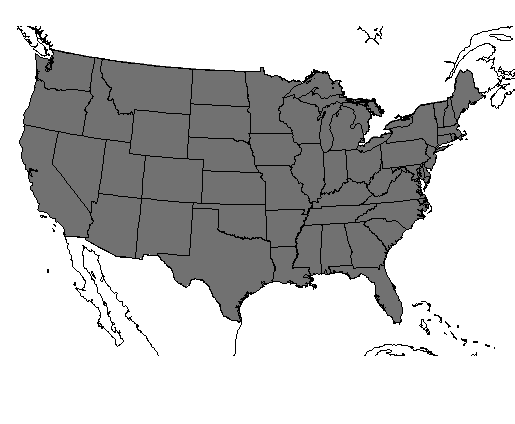 Color can range from bright green to a deep red, depending on conditions. Flowers pink & purple, although this plant does not flower frequently. Like most Tillandsias, it benefits from a little air movement, but does not require as much as many other species. It's larger & more robust size also makes it more appropriate for use with slightly larger species (i.e. Phelsuma, Correlophus, Rhacodactylus) than other Tillandsias. We recommend mounting them near a vent, or anywhere in an enclosure which has at least some airflow. 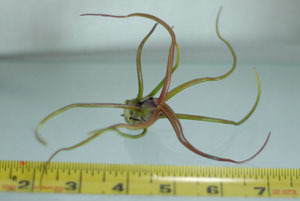 A bizarre looking pseudobulbous air plant that tolerates a fairly wide range of conditions. 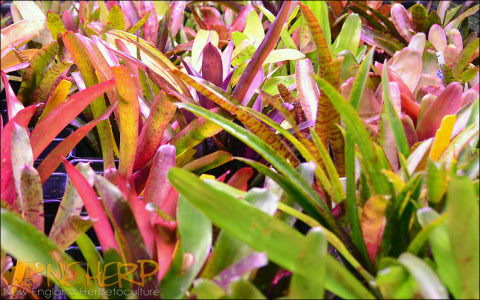 One of our favorites at NEHERP, the colors range from a deep purple to a bright green, with appearance being dictated by growing conditions. A fairly moisture-tolerant species that doesn't require as much air movement as many other Tillandsias. Larger than it's equally unique cousin T. bulbosa, this plant is covered in trichomes, giving it a white fuzzy appearance. 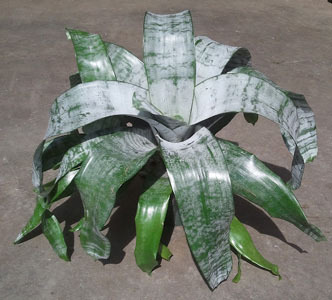 If planting this in a more humid environment, we suggest mounting it sideways or upside down to prevent water from collecting in the bulbous base of the plant. Due to it's larger size, we've planted these in many arboreal Gecko habitats with success. We wouldn't recommend planting this species in enclosures averaging above 85% humidity, unless a fair amount of air movement is provided. 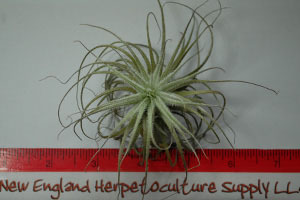 One of our most popular air plants! Fuego can turn bright red almost top-to-bottom under bright & humid conditions. Flowers purple & yellow. 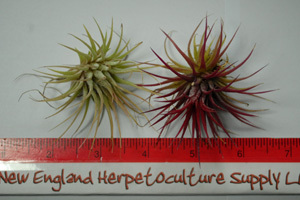 A type of ionantha, this variety is well suited to the conditions of many environments. A great little hybrid that turns bright red under good conditions. 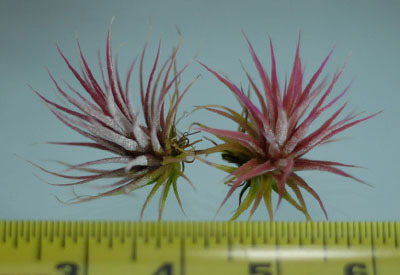 Like all cultivars of ionantha, these tolerate a moderate amount of humidity, but will benefit from a little airflow or being mounted near an opening. Flowers purple & yellow. 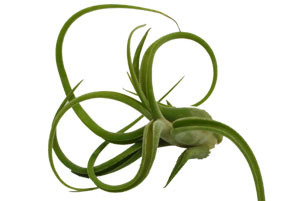 A popular variety of the most popular air plant. The purple blush color will come out in brighter, more humid conditions. Tolerates a moderate amount of humidity, benefits from airflow, and throws pups/offsets fairly frequently. A flat-growing species of Tillandsia that makes a great accent plant for terrarium backgrounds, vines, and more. Very unique, and can be mounted upside-down for a trailing growth pattern. We've had luck planting these in a wide variety of enclosures, as they seem to be fairly forgiving. Tolerates a moderate amount of humidity & moisture, and will thrive under medium/high amounts of light. Throws pups/offsets fairly frequently. Planting tenuifolia up high will result in the plant growing downward into a long, elegant, trailing shape. Flowers are bright blue/violet attached to long draping runners. If planted in a humid enclosure, air movement is is important for the long-term success of this species. A truly a unique little air plant. 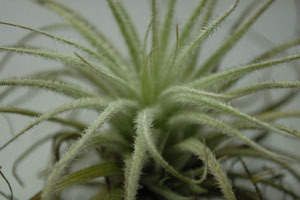 Tectorum's fuzzy white leaves do best when mounted towards the top of a vivarium in slightly drier conditions. This is not a great Tillandsia for especially humid enclosures, and they do best with a decent amount of air flow. Does not tolerate being over-saturated well, so try to mist lightly! This species requires a fairly significant amount of airflow, and must be allowed to dry out completely between misting. Do not place this species in the direct line of a misting nozzle, or anywhere it won't be allowed to dry out. Our live Spanish Moss is sold in quart-size bags, for a roughly 5in clump. A great looking option for temperate vivariums, or for enclosures with a fair amount of air flow. This plant is not tolerant of constant moisture, and requires periods of dryness to thrive. We suggest against using this plant in any enclosure averaging over 80% R/H, unless considerable airflow is provided. 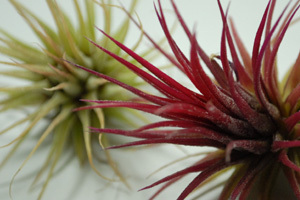 A grower's choice assortment of healthy, popular air plants! Images for illustrative purposes only. Your mix may vary, and could include Tillandsias not currently listed. A budget-friendly way to pick up an assortment of our high quality air plants. This is a great way to save on some of the more basic air plants we work with, and is an especially good choice for enthusiasts looking to try out Tillandsias in their enclosures. 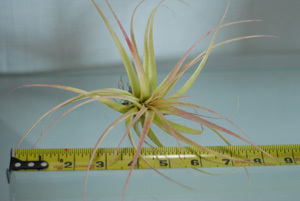 Some of the species likely to be included are T. aeranthos, T. albertiana, T. ionantha 'Mexican', T ionantha v. stricta, T. ionantha sp., and T. myosura. Other varieties of T. ionantha, as well as some other smaller cultivars might be included as well, based on our availability! 10% Off Already Discounted Pack Price! This assortment of air plants includes a nice mix including inexpensive, average, and more expensive species & cultivars we work with. If you are looking to plant a vivarium or build some "showy" vivariums, this is our recommended choice. 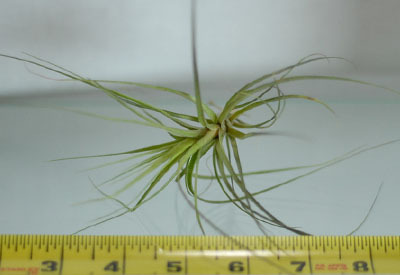 Species may include anything on this page, with at least 40% of the mix being picked from the more expensive plants (like T. brachycaulos, T. bulbosa, T. caput-medusae, T ionantha 'Fuego', T ionantha v. stricta, T. tenuifolia 'Blue', and T. tectorum), and the remainder being less expensive species. We might also be able to include less common species if we've got any currently in stock, but no promises. Assorted, individually packed & labeled Neoregelias. The same guarantees and quality as buying Neoregelias individually, only with a "grower's choice" price to match. Select "Minis Only" for plants that'll grow to less than 9-10in, or Med/Minis for a wider assortment growing up to around 12-13". Use this tool to see which shipping method(s) qualify! Are you located within 1 transit day from us? What's the lowest expected temp between our locations? 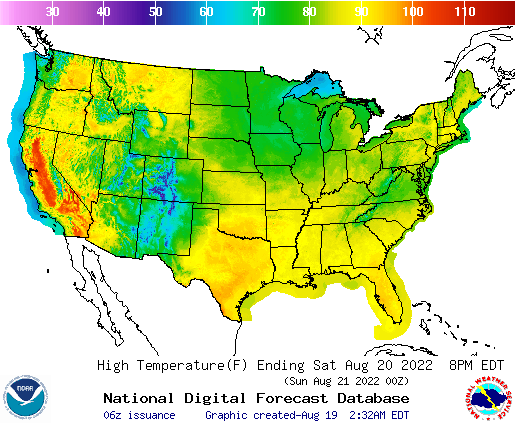 What's the highest expected temp between our locations? What's the coldest expected temp over the next few days? 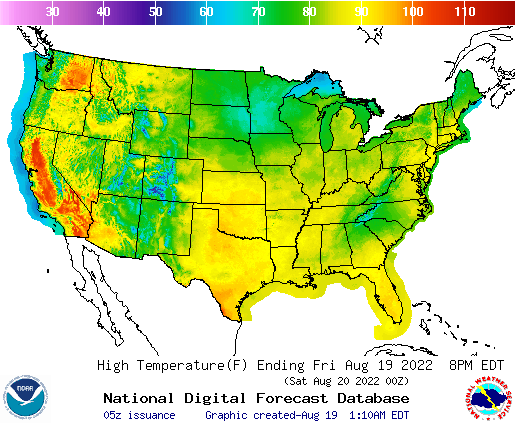 What's the warmest expected temp over the next few days? It is very unlikely your plants will survive if shipped using standard service in these temperatures, and we don't recommend it! You can choose to take that risk by selecting Standard shipping during checkout (the default option), but we won't be able to replace or refund any items if they arrive damaged. If you are ordering a bunch of heavier supplies and perishables, it's often cheaper to place two separate orders so that the supplies can cheaply ship ground while the smaller perishable box ships express. Sorry, but we do not offer "hold for safe window" service when standard shipping is selected in temperatures this extreme. Please select express shipping during checkout, to give your perishables the best chance of survival. We aren't able to offer our guarantee when temperatures are below 20°Fabove 95°F, so our team will hold your order in anticipation of the soonest safe shipping window. If your order is held, we'll email you ASAP to work out a safer shipping schedule & discuss your options. 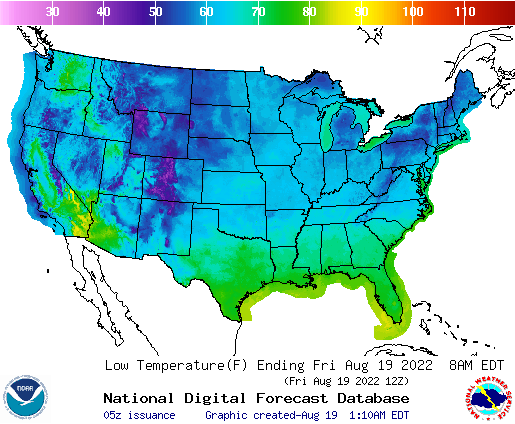 Depending on your input, we'll either ship now (if you don't mind the risk), or hold/reserve for the next available safe (guaranteed) temperature window. We check the weather every morning when we open up, so we'll be sure to ship your order as soon as we safely can. Express-shipped orders which need to be held due to weather have their products reserved and hold their place in the outgoing order queue. (It's "first come, first served" once we're able to ship!) Only express-shipped orders qualify for our "hold for safe window" service when temperatures are this extreme. An Express shipping quote is available on the last page of checkout before finalizing payment. Please select express shipping during checkout if you'd like to qualify for our live arrival guarantee. Orders shipped using standard service in temperatures like these don't carry a live arrival guarantee, and we don't recommend it unless you feel comfortable taking that risk. If you are ordering a bunch of heavier supplies and perishables, it's often cheaper to place two separate orders so that the supplies can ship (inexpensive) ground while the perishables ship express. Since temperatures are so mild right now, we're able to guarantee live arrival using whatever shipping method you choose. Pretty sweet, eh? You live within a 1-day ground transit zone, so standard shipping is an appropriate option to select during checkout. We aren't able to guarantee shipments when temperatures are below 20°Fabove 95°F, so our team will temporarily hold your order in hopes that a slightly safer temperature window will develop. In that event, we'll email you ASAP to work out a safer shipping schedule & discuss your options. Orders which need to be held due to weather have their products reserved and hold their place in the outgoing order queue. (It's "first come, first served" once we're able to ship! )If you don't mind the drive, you could also pick up your order and save on the shipping cost while mitigating all the associated risks. 40-Hour Heat Pack(s) Included Free! Non-Toxic Ice Pack(s) Included Free! We recommend using inexpensive standard shipping! Since you live so close, you qualify for our best shipping guarantee at the lowest cost pretty much year-round. 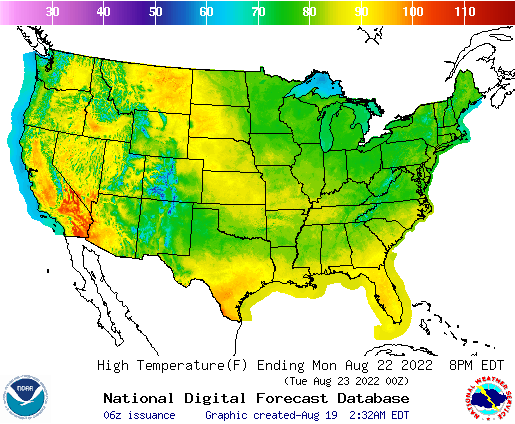 So long as temperatures stay between 20-85°F, we guarantee all shipments will arrive to you in great shape regardless of shipping method. Plus, you'll get everything you order pretty quickly since it only takes a day in transit! Important: We process & ship orders as quickly as we can. While we do our best to ship supply orders the same or next business day, it's not always safe (or possible) for us to do the same with orders containing plants. Plant orders carry a processing time of 1-3 days and are always scheduled to avoid weekend transit delays to help ensure healthy arrival. Please keep this in mind if you are ordering a few days before a weekend, since your order will probably not ship until the following Monday. View our full Order Processing Page for complete info.